Some interesting results there and good news in particular for Warwick and University of Nottingham graduates. • The outlook for the current recruitment season has improved and employers are expecting to increase their graduate recruitment by 2.7% in 2013. • Almost half of employers expect to recruit additional graduates in 2013 and a further third plan to maintain their intake at 2012 levels – employers in eleven out of thirteen key industries and employment areas are expecting to take on more new graduates than in 2012. • Whilst the total number of graduate vacancies is set to increase in 2013, recruiters expect that more than a third of this year’s entry-level positions will be filled by graduates who have already worked for their organisations – either through internships, industrial placements or vacation work – and therefore are not open to other students from the ‘Class of 2013’. 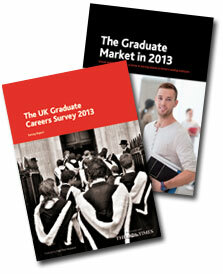 So perhaps there are grounds for optimism in the graduate employment market. This entry was posted in Education, employability, HE, League Table, Students, University of Nottingham and tagged employability, HE, High Fliers, League Table, ranking, Students, Telegraph, University of Nottingham by Paul. Bookmark the permalink.